The Stat Matrix with various chips. The Stat Matrix (ステータスマトリックス, Sutētasu Matorikkusu?, lit. "Status Matrix") handles Sora's stat growth and abilities in Kingdom Hearts Re:coded. 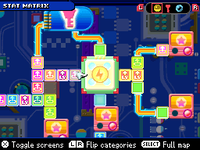 Similar to Final Fantasy X's Sphere Grid, you progress on a line of circuitry within the matrix, which is segmented into slots. Throughout Sora's quest, he'll receive Stat Chips (ステータスチップ, Sutētasu Chippu?, lit. "Status Chips") that can be placed in these slots, raising the appropriate stats and progressing further through the matrix. When Sora levels up, he receives Level Up chips, that will grant Sora a boost to all of his basic stats. Chips are powered by CPUs that appear throughout of the matrix. Chips must be installed first next to a CPU and then building outwards from it. If two CPUs are linked by a path of chips, it activates Dual-processing (デュアルプロセッサにしよう, Dyuaru Purosessa?, lit. "Dual Processor"), which doubles the effects of the chips in the connecting path. While chips cannot be uninstalled, they can be replaced with other available chips. The Stat Matrix begins with only a small area available, but each chapter that is completed in the story unlocks a new area, with its own CPU. Scattered throughout the matrix are a number of features that unlock new capabilities for Sora. These include Bonus Boosters (ボーナスブースター, Bōnasu Būsutā? ), Command Expansions and Accessory Expansions, and Cheat Tuners (チートチューナー, Chīto Chūnā?). Bonus Boosters unlock abilities when linked to a CPU through chips. Most of them can be switched on or off once they have been activated, with the exception of Scan. There are a total of twenty seven Bonus Boosters in the Stat Matrix, but some abilities are activated through multiple boosters. If more than one booster for an ability is switched on, the ability will be leveled up. Command Expansions are blue and marked with a key symbol, and they increase the number of commands that can be equipped in the Command Matrix. Accessory Expansions are green and marked with the image of an armlet, and they increase the number of accessories that can be equipped in the Gear Matrix. 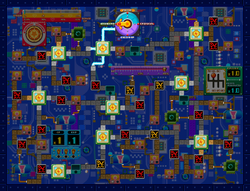 Each expansion activates after chips have been linked to both of its connectors. There are a total of five Command Expansions and three Accessory Expansions in the Stat Matrix. Five different tuners appear in the Stat Matrix. Once they have been linked to a CPU through a path of chips, they can be activated to affect different aspects of gameplay. Using cheats generally has both positive and negative effects. Some trophies can be obtained by setting the Cheat Tuners to their more difficult settings. Bug Chips (バグチップ, Bagu Chippu?) are obstacles that block your progress through the Stat Matrix. They have a similar design to Bug Blox, and they appear in two forms, Bug Chip: R and Bug Chip: Y, which are colored red and yellow, respectively. They can be removed from the Stat Matrix by using Debug Devices (デバッグコード, Debaggu Kōdo?, lit. "Debug Code"), which come in two varieties to remove their corresponding Bug Chip. There are a total of seventeen Debug Device: Rs and four Debug Device: Ys. Destiny Islands: Sector B for 8000 SP. 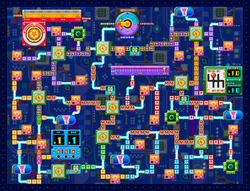 Traverse Town: Sector E for 4000 SP. Wonderland: Sector B for 500 SP. Agrabah: Sector B for 1000 SP. Agrabah: Sector C for 500 SP. Hollow Bastion II: Sector B for 2400 SP. Hollow Bastion II: Sector C for 800 SP. Hollow Bastion II: Sector D for 2700 SP. The eastern section of the Rose Garden, in Wonderland. The western section of Layer 04, in Olympus Coliseum. The northern section of the Cave / Entrance, in Agrabah. Destiny Islands, in Hollow Bastion II. Over the plaza of First District, in Hollow Bastion II. Past the eastern gate of the Castle Gates, in Hollow Bastion I.
Retrieving the Teacup for Alice's first quest, in Wonderland. Retrieving the Wristbands for Philoctetes's first quest, in Olympus Coliseum. Retrieving the Silver Ring for Aladdin's first quest, in Agrabah. One Debug Device: Y is rewarded by Leon and Yuffie after obtaining all Ending Cards. One Debug Device: Y can be purchased from the Moogle Shop for 75000 munny, after finishing the game. One Debug Device: Y can be rewarded from completing the Hollow Bastion II Score Attack B. One Debug Device: Y can be purchased from Hollow Bastion: Sector B for 102000 SP. Install chips in every slot in the Stat Matrix. Use every type of cheat. Replay and complete an episode with the HP Cheat set to 0%. The full Stat Matrix with no Bugs Chips demolished and no chips installed. The full Stat Matrix with all Bug Chips demolished and chips installed.